Not all motorcycle GPS devices are the same. In fact, not all GPS devices are made for use on a motorcycle. We look at the most important features to help you decide which is the best motorcycle GPS for you. There are a lot of different features on a GPS. Some are absolutely required while others are unneeded and simply add to the price unnecessarily. You would be surprised, at times, how little you get for an additional $400. Having a list of the important features to you can result a fairly significant cost savings and better ownership experience. So let’s look at some features to help select the best motorcycle GPS. There are many display sizes available on a GPS. These days, the smallest display will come in at 4.3 inches measured diagonally (just like a television). Next up is 5.0″ which is the largest as of this date in terms of motorcycle GPS devices. You can then begin to get into the car, truck and RV space where there are 6.0″ and 7.0″ displays. Most will find anything larger than 5.0″ to be too large. You don’t have a lot of space for mounting gadgets on a motorcycle and the larger screen size will take up too much space. As to the smaller 4.3″ size, that’s popular and will work ok. I prefer the 5.0″ size though. Easier to see but not too large for mounting on a handlebar or clutch. This is what separates a motorcycle GPS from one made for a car. A motorcycle GPS is weatherproof. That means that you can use it with light to moderate rainfall. A car GPS will have issued if it gets wet. You can get around those issues with a good weatherproof case but a bare car GPS exposed to the elements will have issues. By car GPS, we’re talking about a Garmin Nuvi, Garmin Drive, TomTom Go. Items like the Garmin Tire Pressure Monitor Sensor are additional features that you will find on a Zumo (it’s known as TPMS). 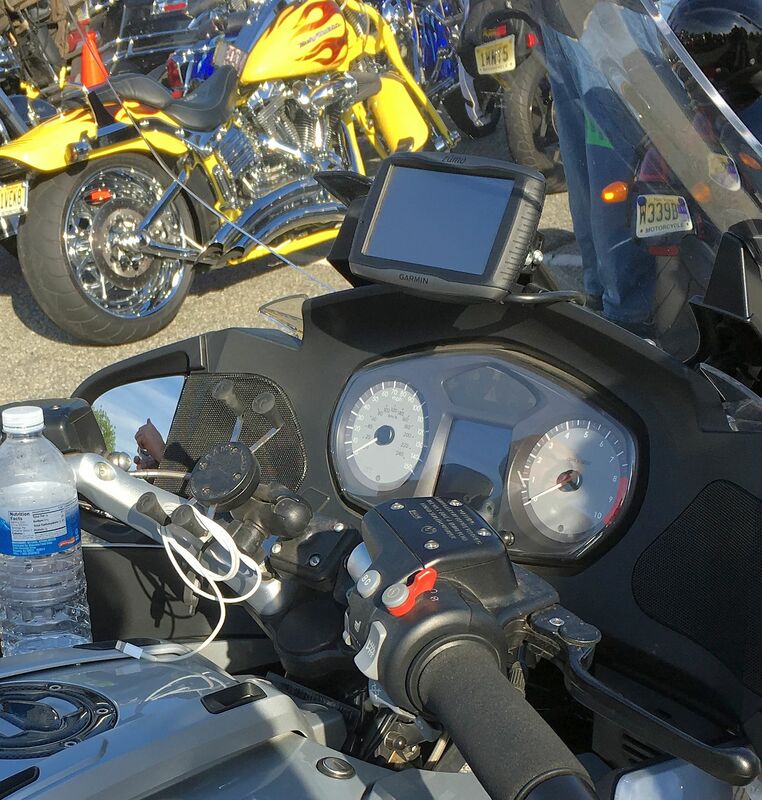 The mounting systems on most motorcycle GPS devices are the same as they have partnered with RAM Mounts for handlebar and clutch attachments so as long as you are buying a GPS made for motorcycles, you should not need to buy a new mount. Ease of unit removal is important. I suggest removing the GPS when not in use to prevent theft. The ability to easily remove the device from the mount is important and should be considered. This is often what differentiates motorcycle GPS models. Ironically, the higher the display size, the more software options you get. Higher end models will have better integration with a smartphone for features like live traffic, the ability to let people know where you are and integration with popular music apps like Pandora. Some motorcycle GPS models allow you to select the type of route you want like more turns or hills or the ability to bypass highways. Free map updates are another important feature to look for. While maps may not change much, it’s good to update the GPS periodically. Map updates can cost a lot of money, so consider a GPS that has free lifetime map updates included. You may never need support but it’s good to think about this ahead of time. Select a manufacturer that is known for good support in the country that you reside in. Garmin’s support is located in the US. I believe that is the only major GPS manufacturer with support in the US which is where the company’s headquarters are located. Most of the important features have been discussed and this should help to select the best motorcycle GPS. There are several manufacturers and from experience, you can’t go wrong with a Garmin Zumo. Good hardware, accurate maps and decent support.